...to hang with the young crowd! My Nannie, now 98 years young, was able to come up for my sister's bridal shower this past weekend. 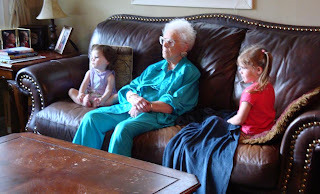 I didn't get to spend much time with her this visit, but my girls just love their great-grandma, my mom's mother. I find this hilarious because she was the "strict grandma" when we were growing up. Nannie knew how to have fun and play with us, but you didn't dare even leave your shoes anywhere except the closet or she would coming looking for you. She also did bed inspections. Your bed not only had to be made when visiting Nannie, but it had better be made perfectly. 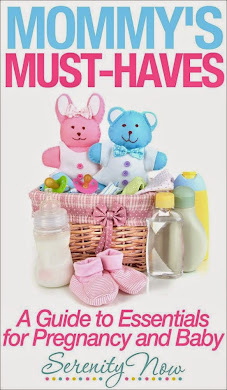 Needless to say, we very much enjoyed it when our mom and Nannie would go shopping in Tyson's Corner and leave us with our grandfather, whose favorite thing to say was, "What do you want, babyducks? Poppy'll buy you anything you want." While I was cleaning up dishes and platters from the shower, Nannie occupied Michaela Byrd with a ballerina book. They read it about 42 times. Then the three *girls* sat on the couch in the Living room (don't you love the amazing "distressing" job my kids have done on the surface?!) and watched cartoons for a bit. I think Nannie's favorite was Little Bear. That is so sweet. What an adorable grandma! My grandma B. was the "strict" grandma too, but boy had she softened up by the time my kids came around! So glad you can spend quality time with such a wonderful grandma. Bet the girls had a wonderful time entertaining great grandma at their house. Such a cute nap picture. Precious! Glad you have photos of all 3 together!! My last grandparent passed away 3 years ago. My kids know who Grammy is, but I don't know if they will truly remember her. Photos like these will be the connection for them.